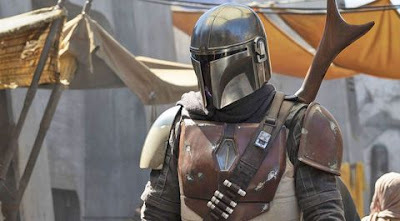 The Movie Sleuth: Galactic News: Mandalore Wolf and Cub - The Mandalorian Plot Revealed? Galactic News: Mandalore Wolf and Cub - The Mandalorian Plot Revealed? They showed a sizzle reel of Jon Favreau talking about how he's excited because they have delved into some of the EU for this series. They also talked about the different directors as well. The main thing I remember here is that the central plot revolves around the main character and a baby. I guess the Mandalorian encounters a baby on one of his missions that he is supposed to kill, but instead of that, he ends up saving it and a lot of the rest of the story revolves around their growing relationship and his efforts to keep the child safe and protected. They showed a ton of artwork and stills. They spent a decent amount of time talking about the Mandalorian's armor and how it goes through changes and upgrades. They mentioned the large woman character who is some sort of Chief of theirs? I don't remember her name or whether she was a villain or not. They also talked a lot about different planets and terrains but I don't remember too many specific details. We will also mention that this user has been correct in the past. Obviously, this is a similar plot line to the classic Lone Wolf and Cub.